Recent Surrey Weather Conditions: How can we help? A massive amount of rain in Surrey, United Kingdom has led to flooding that is creating problems with trees located in landscaping areas near homes and businesses. Extremely damp soil and rushing water can cause a tree to topple easily leading to damage to a building’s roof. In addition, a falling tree can injure people severely. Property managers and homeowners are responsible for ensuring no one receives injuries on their land. As flooding water moves, it can push heavy tree stumps against cars or fences leading to property damage. Fortunately, it is easy to have tree stumps, damaged trees and other plants cleared by a professional tree surgeon. A TW Tree Stumps Removal tree surgeon has over seven years of experience dealing with landscaping and gardening clearance throughout Surrey, Guildford and nearby regions. Working around plants, shrubs and trees requires specialized knowledge to ensure the job is completed correctly. Only a specialist understands how to diagnose a tree to determine if it requires removal or is salvageable. Trees located in yards or fields provide a vital function to help prevent soil erosion while providing shade and beauty. In many cases, it can take a person’s lifetime for a sapling to grow into a sturdy tree that increases the value of your property. However, trees occasionally require removal by a professional who knows how to accomplish the task without causing damage to nearby landscaping. TW Tree Stumps Removal has experts ready to arrive quickly to remove tree stumps with heavy-duty equipment. Removing dead or damaged trees is a strenuous and complicated job requiring an understanding of moving heavy objects while protecting other plants and shrubs. After arriving at a private residence or commercial property, the tree specialist begins to analyse how to remove broken branches, decayed trees or ugly tree stumps. Before performing any work, we discuss tree removal and garden clearing options with clients. A professional tree surgeon will use a large crane to reach the tops of trees to trim branches that are encroaching on rooftops or fences. This task is dangerous for amateurs due to nearby electrical power lines, telephone wires and wildlife. Old tree stumps located in yards often loosen during torrential rains causing various problems for homeowners and property managers. Many tree stumps weigh hundreds of pounds leading to needing strong towing devices to remove the objects from the ground. Arboricultural experts will have industrial-strength machines to grind complete trees, branches and stumps into sawdust before hauling the substance from a property. 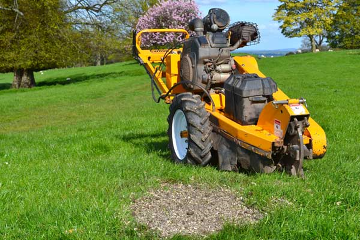 For a full list of services provided by TW Tree Stumps Removal see our tree services section.